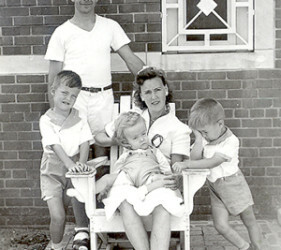 The Grabers, two young boys and their German-born parents, lived in New Jersey in an apartment building owned by a Polish landlord. When Hitler invaded Poland, the relationship became strained, so the Grabers moved. The landlord contacted the FBI. 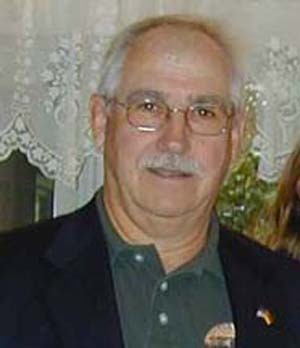 Mr. Graber worked on “war sensitive technology” for the International Nickel Company. The FBI began to watch their home. In September 1942, they took him for several hours of questioning. In November, they ransacked the house. Mrs. Graber, several months pregnant, fainted and fell down the stairs. Shortly thereafter, Teddy was born, premature and handicapped, and had to remain hospitalized. 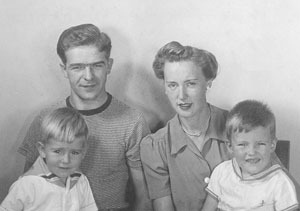 The family was advised that they would be interned after Christmas. Mr. Graber wrote to President Roosevelt pleading for mercy. The agents came without notice in mid-January. The family threw together their belongings and picked up Teddy at the hospital. The family was interned with hundreds of others at Ellis Island until they were shipped to Seagoville, Texas, several months later. One and one-half years later they were sent to Crystal City. In despair, after being pressured to repatriate, the Grabers agreed to return to Germany. With the Eiserlohs and many others, they were shipped to New York and set forth on their hazardous journey. In the camps and on the SS Gripsholm, they met many Latin Americans, also to be exchanged. At least one German Jewish man was also sent back. Exchanged and dumped in Germany, they made their way through the ravaged terrain to Mr. Graber’s family. Unable to find work, Mr. Graber and the eldest child, age 5, hitchhiked some distance to Mrs. Graber’s hometown. Along the way, French agents stopped them, tore up Mr. Graber’s American ID and spat in his face. Only young Werner’s American citizenship saved them. Mr. Graber and Werner lived in a wooden barrack temporarily, refugees from the West. Mr. Graber’s application for assistance was denied. How could an impoverished German refugee from America exist? In mid-April Mrs. Graber’s parents’ home where the family was living was destroyed in a tank attack. The post-war years were extremely difficult. Food and medication were scarce. Teddy died in 1948 of pneumonia. Mr. Graber took over his father’s tooling business because a US Army truck accidentally killed his father while he was getting milk from a local farmer for the grandchildren. 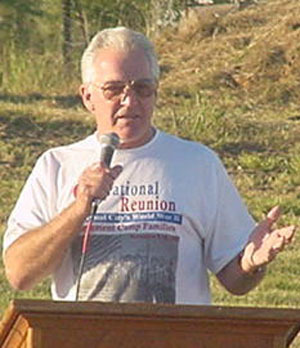 The boys exercised their birthright and returned to the US in the late 50s. Mr. and Mrs. Graber never returned. Mr. Graber always tried to justify the decision to repatriate to himself. Was it the right thing to do? Did he deprive his children of a normal life? Should he have stayed in the camps and returned to New Jersey again? Who knew how long they would be imprisoned? Would life have been easier had he stayed in the US? Mr. Graber’s lifelong bitterness and self-doubt are another cruel legacy of internment. The Grabers have tried to learn why they had to endure such an experience. What had their landlord said? Was it Mr. Graber’s job? Mid-April 1945. It was a relatively sunny day in Gernsbach, a small town in the Black Forest of Germany. My brother, Werner, and I were running around the small vegetable garden interspersed with fruit trees. Our father and grandfather were digging up the ground to prepare new vegetable beds. At first, we heard only a very low hum but it quickly became louder and louder. Then the air raid sirens started shrieking. By that time, airplanes were visible. I was a toddler, so I could not count much past 20, but there were many more than that anyway. I was fascinated as small objects started to fall out of the airplanes, not realizing they were bombs that could kill me. Today, 55 years later, Werner and I are still trying to understand how he, my other brother, Teddy, and I ended up in ravaged Germany during some of the most vicious fighting of WWII having bombs dropped on us by our own people. Germans couldn’t understand that we were refugees from America. They did not know what to make of us. But since we spoke German, we were accepted without much thought. Fortunately, living in the towns of our respective grandparents, townspeople still remembered Mom and Dad. Dad had immigrated to the US in November 1935. Mom arrived in November 1937. They married in February 1939, recent immigrants filled with hope and looking forward to their new lives in America. This is the story of how the country my parents loved crushed their hopes and dreams, as well as their family. Early September 1942. Theo Graber, 29, Emmy, 22, Werner, 3 and Gunther, 1 1/2 were living in Elizabeth, New Jersey, on Jefferson Avenue, a quiet residential street. We just had moved there from Bayonne where we lived in a two-family house owned by Mr. Stenzinsky. He had emigrated from Poland years before. As Germany invaded and defeated Poland, he blamed the Grabers for all the misery suffered in Poland. Life with Mr. Stenzinsky became unbearable, so my parents decided to move to Jefferson Avenue. Our Polish landlord also was responsible for the FBI’s increasing interest in the Grabers. The International Nickel Company employed my father in Bayonne, NJ, working with “war sensitive technology.” One day when he came home from work, my mother, Emmy, told him about the two new men who had moved into the neighborhood. She observed that they were well dressed and very neat in their hats, ties and gray suits. They had been there for two days and had not even thrown any paper in the gutter. Dad, suspicions aroused, peeked through the curtains at the dark green Chevy sedan parked across the street and wondered what they wanted. We found out all too soon. On September 25, there were several hard knocks on the door and the two well dressed, armed men bolted through the door. They asked Dad if he was Theo Graber. He said he was and asked them to identify themselves. “FBI” was their response and they flashed their badges. With little regard for small children, they informed Theo and Emmy that they had to go with them to the local FBI bureau for questioning. When Mom asked who would watch the children, they told her to get a sitter. New to the area, my parents didn’t know anyone who would watch us. Mom suggested they take Dad alone, but said she’d come looking for him if he didn’t show up in a few hours. After some convincing, they took Theo and left Mom home with us. Theo was interrogated for several hours, questioned about his job, his finances, what German organizations he belonged to, his relatives and friends. All throughout, however, he had the feeling the agents knew the answers before they asked the questions. They returned Theo back to his family. He was never given any reason for being interrogated or told what crimes he was suspected of having committed. He was only an “enemy alien” not worthy of fair treatment. In late November they were back. Bang, bang. Theo answered the door. “You are under arrest,” he was told, as the agents pushed him into the kitchen. Emmy, upstairs coming out of the bedroom, saw this, fainted and fell down the stairs. One of the agents asked who she was. Theo said it was his wife. They wondered what her problem was. Theo told them she was pregnant and tried to help her. Another agent in the meantime was going through all the closets, dressers and whatever else he could turn over, never revealing what they were looking for. They told us that they’d be back to get us after Christmas. As a result of the fall, on December 2, 1942, Teddy was born 2 months premature. His right leg was deformed and he suffered from spin bifida. My parents were told that he would never walk by the doctor at Elizabeth General Hospital. On December 31, 1942, Dad had even written to President Roosevelt to plead his case, but it was to no avail. (12/31/42 Letter to FDR) The local FBI bureau told him that since we boys were American citizens we would not have to go to prison. Dad’s feeling was that we were a family—-either we all go or nobody goes. On January 16, 1943, without notice, FBI Inspector Stern and two Elizabeth City Cops came to get us. We were allowed to bring only what we could carry in hastily packed suitcases. 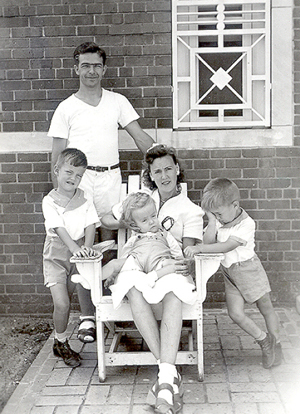 They swung past the Elizabeth General Hospital to pick up Teddy who had been there ever since he was born. They took us to the Ferry landing to go to Ellis Island. We huddled there freezing on the pier under close watch waiting for the ferry. Mom and we three very young children shared a small room with another woman with two young children. Teddy was still very sick. The men were in rooms, each occupied by about 30 men. During the day, everyone was in the large reception hall. We had little time together as a family. On January 19, 1943, we were told to pack and taken under guard by Coast Guard Cutter to Jersey City. We had no idea where we were going. The military had just completed a makeshift landing dock where we stepped on land. It was conducted like a clandestine operation, perhaps to keep their treatment of us a secret. In the train station, we waited several hours for a train. We were kept separate from everyone else, closely guarded by several plainclothes agents. Everyone kept staring at us like we were criminals. Husband, wife and three small children, they must have wondered, what did they do? The train finally came and we were given a compartment for ourselves to keep us separate from other passengers. I guess they thought we were dangerous or would try to escape. Finally, they told us that we were going to Texas. After endless 4 days, we wound up in Seagoville, Texas. In that camp, a former women’s jail complex, we were assigned 2 rooms to live in. The buildings were bungalow style with around 10 rooms each. Armed agents on horseback controlled the complex. The complex also housed a contingent of Japanese. Life in general was miserable. Mom and Teddy were mostly in the hospital. Teddy, of course, required continuous care, and Mom was pretty much always sick. To this day, I cannot imagine how my mother and father managed all of this misery. Dad was trying to find out why he was in the camp and what he had done that he deserved to be here. There were no answers. There were no court hearings, there were no accusations, there was never any reason given why he and his family were so brutally removed from their daily lives and sent to this desolate, miserable place. He kept thinking that the reason he left Germany in first place was to live in a country where freedom and above all, civil liberties and rights, had a meaning. Instead, here he and his family were imprisoned with no prospect of leaving, only endless time, self-doubt and torment. 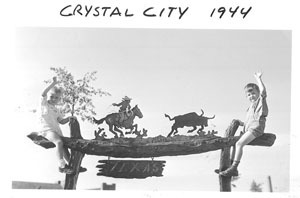 Approximately a year and a half later, on June 7, 1944, we were shipped to Crystal City, 20 miles from the Mexican border. There we could live in a bungalow and function as a family again. There even was a kitchen where Emmy could cook family meals. There were no trees, however, and it was unbelievably hot. Teddy still spent most of his time in the hospital. Dad worked in the power room, just to keep his sanity. One day, some officials visited and he was asked if he wanted to return to Germany. He decided that returning to Germany was better then being in jail. Understandably, by that time, all Dad wanted to do was to get out. Life in the prison camps was unbearable. Choosing so-called “voluntary” repatriation to war torn Germany is ample evidence of how miserable, embittered and discouraged my father was. Let no one say that under such circumstances, repatriation was in any way truly voluntary. Tuesday January 2, 1945. Six months later, we were taken back to the train station. 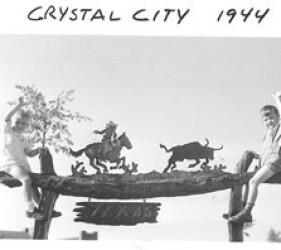 In Crystal City, Dad had constructed wooden crates in which our meager belongings were placed. Dad’s brother partially sold the belongings we left behind in Elizabeth. Others had been stolen. (My uncle had been a citizen for a number of years. But he was German by birth, so he still he had several sessions with the FBI. However, as a citizen they could not imprison him on mere suspicion like they did to my father.) After 4 long days, we were back in Ellis Island. 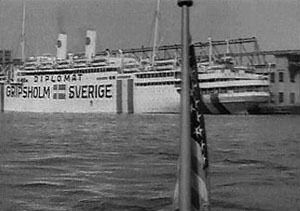 From there it was a short trip to the Swedish ocean liner “Gripsholm.” On January 6, 1945, we departed from New York harbor, my parents and 3 young boys, 5 and under, one an invalid. We were headed for Germany across the Atlantic during January at a time of some of the heaviest fighting of the war. The Gripsholm was painted all white and even at night, she was brightly lit for everyone to see. There were 800 civilians, including many children, and 200 prisoners of war on board. These were to be exchanged for the same number of American citizens caught in Germany by the outbreak of war. On January 18, we sailed past Gibraltar and on January 21 into the harbor of Marseilles. The ship struck a mine and we all panicked. The ship took on water, but thankfully was able to deliver its human cargo intact. There was a very large contingent of non-English speaking people on this shipment. As it turns out, these were citizens of Bolivia, Columbia and several other Latin American countries. The people were German immigrants living in Latin America where they had been kidnapped by Latin American governments, at the urging of the US. They were shipped under inhumane conditions to the US to be used in the exchange program. Only later, as I got older, did I understand that these people had nothing to do with the US and certainly had not volunteered for this exchange. One such individual, a Senor Gustave Dobe, wound up in Winnenden, my father’s hometown, where we ultimately lived. We would see him periodically. A train was waiting in the harbor and all of us were loaded on. The wagons were normal passenger cars. Under heavy American security, we made it in 2 1/2 days to Geneva, Switzerland. With a cog train we were taken up the mountain to the hotel “Les Amons” in Montreux. It was one of the worst winters in recorded history, so it was very cold and there was lots of snow on the ground. Some of the Latin Americans never had seen any snow. The Swiss were not happy to have all these people there. After a week, on January 30, we continued by train to Bregenz. From there, on February 3, 1945, we crossed in Friedrichshafen into Germany. There the one for one exchange took place. Germans (or, in the case of many family members like we children, Americans of German ancestry) walked into dictatorship and bombs, and Americans, whose life America seemed to value more than ours, walked out to freedom. Anyone could see that we were walking innocently toward potential death from the bombs of the country where we were born. Strangely, the exchange itself was anticlimactic after all we had been through. The average German citizen did not seem to know what was going on. In any event, just trying to survive, they certainly did not care. Dad was able to call his family in Winnenden, a small town near Stuttgart, to tell them we were coming. They were shocked and couldn’t imagine why we had returned. They didn’t know how we would eat or where we would live. The Americans didn’t care about such things once we were exchanged and the German government didn’t concern itself with us. We were merely pawns in a cruel game. When we arrived, there still was lot of war activity and German flak trying to shoot down American and British aircraft. The soldiers at one of the flak batteries were happy to exchange bread for the cigarettes Dad still had. Other than that, not much other food was available. On February 10, 1945, we made it to Winnenden by train. Train service was sporadic. In some instances, we had to walk a few miles since the track was destroyed. Mystified people always asked us why we came back. It was very evident that Germany had lost. There was only destruction and misery there. My parents and three very young children were walking the tracks with all their belongings through a war zone. And my father didn’t even know what he had done wrong, except perhaps that he was German. On February 19, my parents decided to go to Gernsbach in the Black Forest, my mother’s hometown. Gernsbach is located only a few miles from Baden Baden. The situation there was the same, mostly destruction. They did not expect us. Again we were asked: why did you come back to this? German men had no choice but to fight. Mom lost a brother on the Russian Front. Mom’s brother-in-law was a prisoner of war in the US, of all places. Dad decided that he needed to find work. The best possibility was back in Winnenden at his father’s tool shop. Werner, 5 1/2 years old, and Dad started out hitchhiking. Periodically they got lucky. Mostly they walked. During this journey, they were stopped by a French patrol. The commander ripped up Dad’s American ID card and spat at him. Only the fact that Werner was an American citizen saved our father from being thrown into the French Foreign Legion. (The French troops had no sympathies for German enemy aliens just arrived from the US.) They also did not care for the Americans in general. There were many East German and Eastern European refugees arriving in Winnenden, so the social system was stretched. The locals had nothing and the refugees had even less. Dad was able to get a two-room living area in a wooden barrack. Toilets were outside and there was one communal water faucet, outside as well. It was a long way from Elizabeth, NJ, but in many ways like being back in internment camp. When applying for social help in Town Hall, Father found out that he did not qualify as a refugee. He was told that there were no refugees coming from the West, especially not from the US. So much for kindness, understanding and support. If you came from the East, running from the Russian Army, even if you were not German and did not speak the language, you were considered a refugee worthy of getting social aid. But if you were a destitute German from America, you were a refugee who no one wanted or cared about. Our father was very bitter and stayed bitter for a long time. In mid-April, our home was destroyed in the tank attack. We found someplace else to live, but survival was difficult. Finally, the war was over. The rebuilding began, but our trials continued. Werner and I started school. They called us “Ami” for American. We were accepted like any East European refugee. Always sickly, Teddy died of pneumonia in 1948 because there was no medication available. Father took over his father’s tooling business. This is natural for a son, but only happened because my grandfather was killed when struck by a US Army truck one evening. He was going to get fresh milk from a farmer he knew for his American grandchildren. Later, another son, Hans, was born. Life was extremely difficult in postwar Germany. We had the bare necessities and not much else, but life went on, as it must. When Werner and I turned 18, we had to make a decision. Do we become German citizens or should we exercise our birthright and remain Americans? We both decided to remain Americans. There really was never a question as to what citizenship we were going to choose. This required a trip to the US Consulate in Stuttgart where we were duly signed up for Selective Service and received a passport. 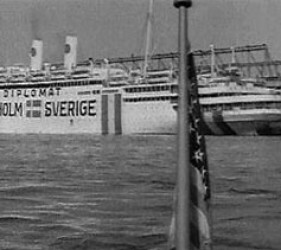 Werner returned to the US in 1958, I returned in 1959. Having learned the tool making trade, finding a good job was not a problem. Mom and Dad never expressed how they felt when we left. It was extremely difficult, but I think they understood our decision. It took them a long time to reconcile with the past. To their very end, my parents tried to find out why they had to endure such an experience. For many years, Dad tried to justify to himself that he had made the right decision asking for repatriation. Did he deprive his children of having a normal life? Would it have been different had he waited out the war in the camp and then gone back to New Jersey? There was, of course, no way of knowing how much longer the war would last or how much longer we would have been in prison. Sadly, he was never free of the self-doubt and bitterness all his life. This constant self-examination is another cruel legacy of internment. “Now I reach beyond the sixty years that have gone by, two, three decades into the thirties and the twenties, a time when our moms and dads left their respective homes to come to America’s shores to look for a better and more peaceful place to realize their dreams and hopes in this land of the free. We, here today, are the offspring of those dreams and hopes because if it wasn’t for them we wouldn’t be here in the middle of the camp’s swimming pool reconstructing their honor and memories of which we are a part of forever. To this day, when Werner and I mention our experiences to anyone here in the US, it is met with total disbelief. It would be impossible to make up such an experience and story. For several years, Werner and I have worked to get our government to admit that not only the Japanese were mistreated during WWII. We want it to admit that there were also many Germans affected. We simply want an admission of wrongdoing and an apology. This is for our parents, although they are both dead now. They deserve it for what they went through. We also want assurances that something like this will never be repeated for anyone of a different nationality. My brothers and I still believe in the American democratic system. This belief could be seriously undermined, however, if the US does not acknowledge all the ethnicities, including German Americans, which were affected by its wartime policies. If my country can send me back to Germany and drop bombs on me, it should be able to admit to this very ugly period in the history of the United States.